I can’t believe it’s been almost a month since I last posted to my blog. I’ll probably get into that a bit more in a later post. For now, let me say that I’m sorry to be away for so long. 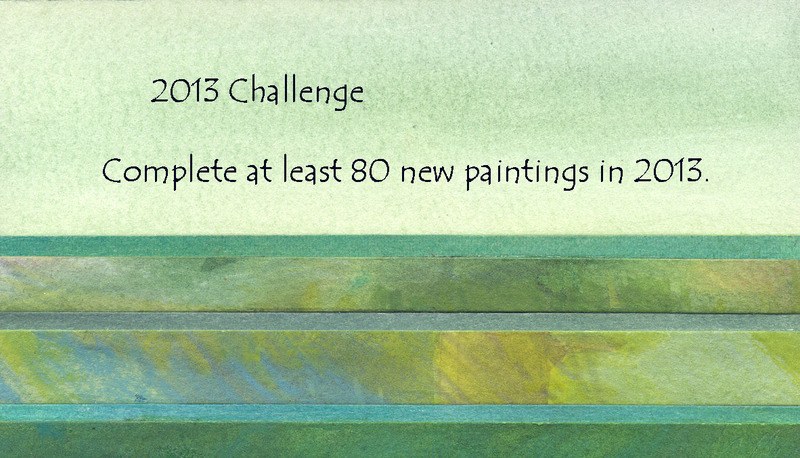 As many of you know, I had an 80 painting challenge for 2013. 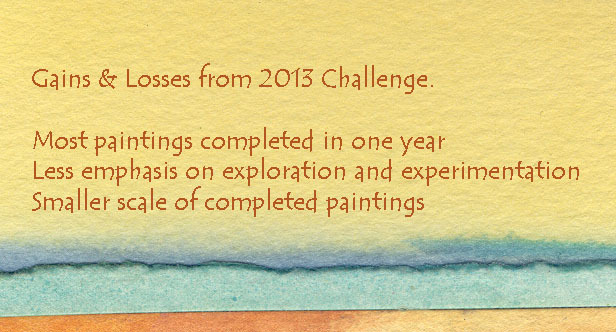 I thought that I was going to end up with 81 paintings for the year. 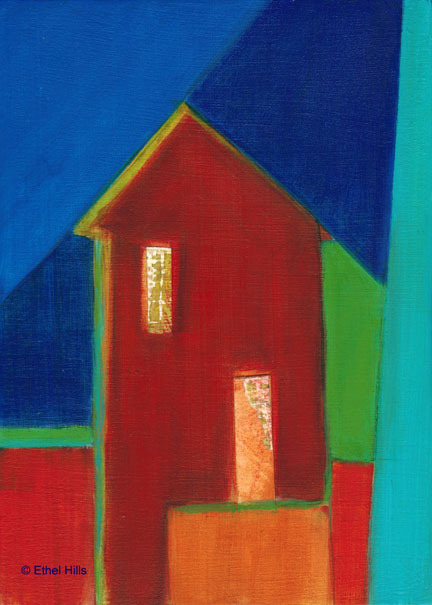 After my last post, I decided that the last painting I posted, Shelter #10, really wasn’t done. I’m still struggling with it. Hopefully, you’ll see the final painting posted here in the next couple of weeks. Here is the other painting that I was working on at the time. I finished this just before the end of the year. I apologize. I’ve gotten behind on my weekly posts. I hope to get back to my regular schedule by next week. Today, I’ve got two paintings for you. I started these at the same time and have been having a very difficult time finishing them. I think I finally have it “under control”. These started out to be just acrylic paintings with no collage, but I ended up adding pieces of paper to pull the paintings together. The simple line drawings that started these paintings didn’t seem to be enough, so I struggled with collage elements as well. I like the way they’ve come out even though they’re very different from my original idea. I’m pretty sure that Shelter #9 is done, but am not as confident that I’m finished with Shelter #10. Any thoughts?? I’ve been working on some small pieces over the last couple of weeks. These are tiny collages. I start by painting a “background” on watercolor paper. Then I tear the paper into smaller pieces, each approximately 3 1/2″ x 3 1/2″. Then I look for bits and pieces with colors that seem to go together. Once the composition is set up, I glue the pieces onto the “background” piece. Normally, I’ll glue just one piece or layer at a time. Once the piece of paper is glued down, I’ll layer it between wax paper and cover it with books and weight it down. I’ll then leave it to dry overnight. This week’s post is an old/new painting. I actually started this quite a while ago with no particular plan in mind. I just had some nice colors and some fun papers collaged onto the panel. It’s been sitting in my studio waiting for a decision. Although this doesn’t look that much like the other work that I’ve been doing, I really like it. 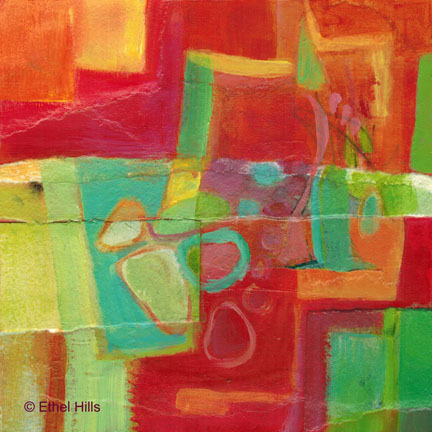 It makes me think of the riotous color of a garden in full bloom. 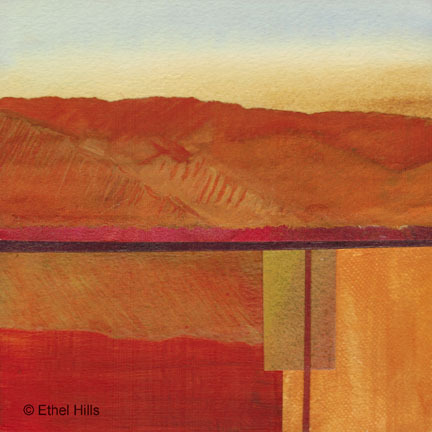 This is #60 in my 80 painting challenge.